Last week for Friday Finance we were looking at the advances in the taxation system with HMRC's plans for Making tax digital. As the temperature has dropped this week, with snow arriving in many places in the north, we are talking about cold weather payments. From the 1st November 2016 to 31st March 2017 the government's Cold Weather Payment scheme is open. If you are on certain benefits you could be eligible for an additional payment if you are on certain benefits such as Pension Credit, Income Support, income-based Jobseeker's Allowance, income-related Employment and Support Allowance or Universal Credit. There are criteria you will need to fulfill within these benefit categories so do check first. If you're not personally on any of these benefits please do think of family, friends and neighbours who could be and would benefit. 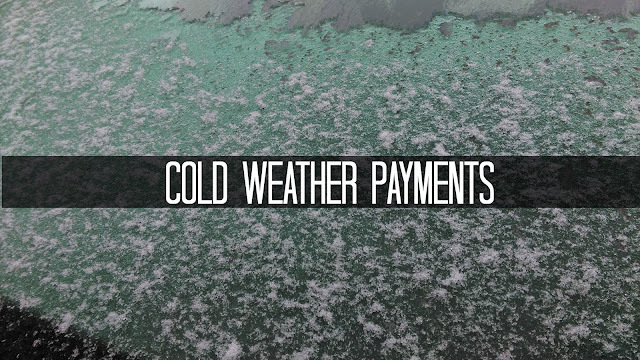 Cold weather payments are triggered when the average temperature in your area is recorded as or forecast to be zero degrees celsius or below for 7 consecutive days. The payment is £25 for each 7 day period of applicable cold weather. If you want to know if your area has a payment due you can check it on the DWP website. Usually you don't have to apply for the cold weather payment to be due to you if all your details are correct and up-to-date. However if your circumstances change do tell your contact. An example of this is if you have a baby or a child under 5 years old comes to live with you and you are on Income Support, income-based Jobseeker's Allowance or income-related Employment and Support Allowance. Along with Cold weather payments there is also the Winter Fuel Payment available from the government. This is for people born before 5th May 1953 and receiving certain benefits. Payments are tax-free and do not affect any other benefits that a claimant is receiving. Check here to see if someone you know is eligible for this payment which could be worth between £100 and £300. Has your area had cold weather this week? Do you know someone who could be eligible? If you want to join in with this week's Finance Fridays then add your link to the linky below. Any post concerning financial matters is allowed. Full details here. It doesn't have to be published today as you have until 23.55 on Tuesday 15th November 2016 to join in. It has dropped really cold here and I know my dad had to buy a new heater last week. I think he claims this payment but I will check. I need to talk to my parent about this, I'm not sure if they are getting it or not.